EGLSF was represented by board member David Hofstetter at the ENGSO General Assembly, which was held in Visby, Sweden 8th-10th June this year. We deliberated, and accepted, an invitation earlier in the year from ENGSO to become an associate member, and to present an application for the ENGSO “Equality within Sports” committee for a two-year term. 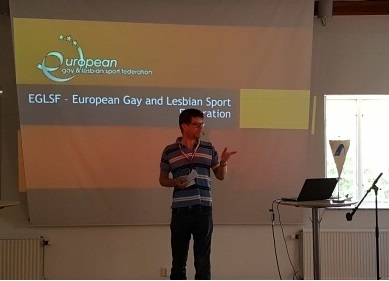 The General Assembly kicked off on Saturday morning with the “Sports and Inclusion” seminar, in which David presented the work that EGLSF does, our goals and achievements. Other presentations included gender equality in Swedish sport, and the ASPIRE project focusing on the inclusion of refugees in sports. The General Assembly concluded with a bus tour of the main sights on the island of Gotland and an official dinner at City Hall.